Silves pictured in the image above still retains much of its Moorish influence,despite the fact most of the town was destroyed by the great earthquake which destroyed much of the town in the 16 century. The towns roots can be traced back to at least stone age times,or more accurately activity has been found dating that far back in history.The museum displays stone age artefacts dug up around the town.It is believed to have been very important during the Roman occupation.Since the town is not on the Algarve coastline like Faro one might wonder why it became so important. The reason was in fact that it was accessible from the Atlantic ocean by the river it is set on.The site was chosen purely for defensive reasons and the ability to construct great fortifications up on the hill.In ancient times this gave great advantage to the defenders.Firstly they would see the attackers early and it was not possible for them to move in unseen.Secondly with limited weaponry the ability to fire down on the enemy gave great advantage to the defender.Si it is not really such a great mystery why it became the capital of the Algarve region for a great part of its known history. The Cathedral apparently is built on the site of the old Moorish Mosque.Lovely as it is one cannot help but wonder how magnificent the Mosque must have been.Remember this was their capital and centre of learning.It must have been a site to behold!. Look at the 2 graphics above and if you did not know better you probably believe,if you were told they were taken in Northern Africa..Unbelievable really!Remember the moorish town was virtually all detroyed in the great eathquake.The Algarve people could not have hated their Moorish rulers that much as they have retained so much of the architecture.It suits the sunny Algarve to! I believe the original Cathedral was built in the 13th century but has been drastically rebuilt and changed throughout the ages,that it is believed there is very little remaining of the orignal edifice. Silves has suffered badly over the ages.Apart from the great earthquake of 1755 there was an earlier earthquake which caused major damage to the Cathedral in 1440.Then it was restored in the Gothic style but after the great earthquake the Rococco style was enforced with the Baroque style coming to the fore.In the twentieth century major reconstruction was carried out and the Cathedral was happily restored to its medieval roots.Its footprint is understood to be layed out as a Latin cross and it is dedicated to "OUR lADY OF CONCEPTION". 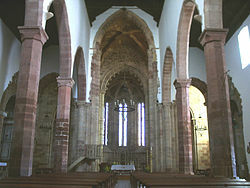 The Cathedral is well worth a visit if you go to Silves as its atmosphere definitely reflects its history. This graphic just gives you a taste of the inner architecture of this historic cathedral. The museum of Slilves is well worth your time to visit.As you have read the town has such a long and dramatic history.Starting somewhere in the stoneage and the museum has exhibits of stone age artefacts dug up in the locality. .Other collections of local finds are from the Paleolithic,Neolithic and Bronze ages.There are many Roman artefacts and it is certain the Romans had considerable settlements in the town and surrounding areas.Roads have been uncovered and there is a local bridge believed to date back to the Romans.Obviously the museum exhibits much from the Moorish years of occupation including a collection of Moorish ceramics ;found during archeological digs.Interestingly the museum houses a 'Well Tank' which dates to the 11 century.This was part of the municipal well which was in use up to the 16 century,when it was blocked up and the building that is now the museum was constructed over the site.It is known that this well was 60ft deep and over eight feet wide and had steps which wound their way down to the water level. 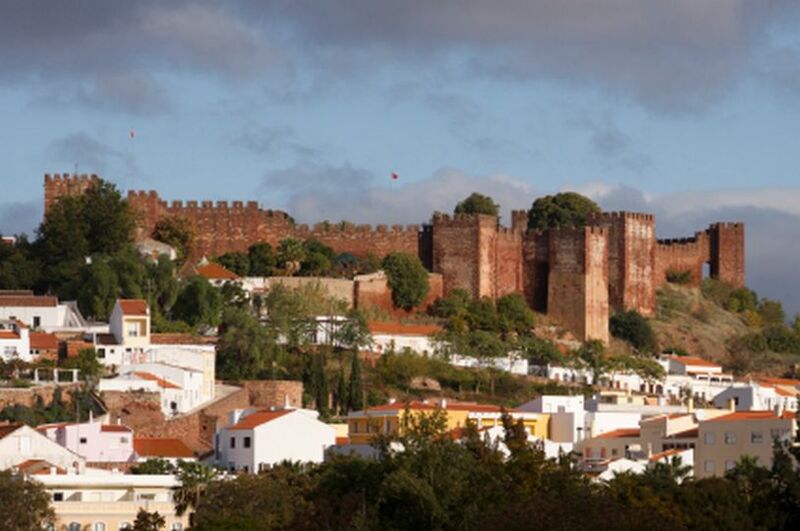 The City Walls.There is a descriptive account left by a Christian crusader who took part in the conquest of Silves.According to this missive the town's defences consisted of the the castle and three lines of stone ramparts. All that remains of these defensive walls are a few stretches built of red sandstone and a number of towers which once protected the residential area of Silves. 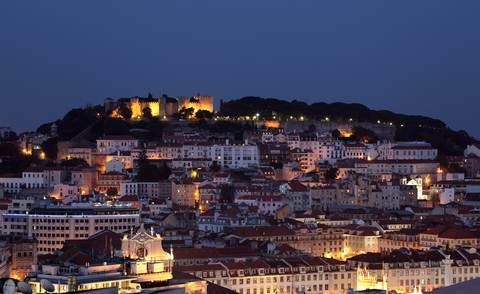 Of the four gates he described leading into the almedina (residential area) all that remains is the Torreão da Porta da Cidade ( Turret of the City Gate). This dates back the 12th or 13th century and was one of four gateways, to the city. Inside the tower are two rooms which were for many centuries the home of the Municipal Camara (council). 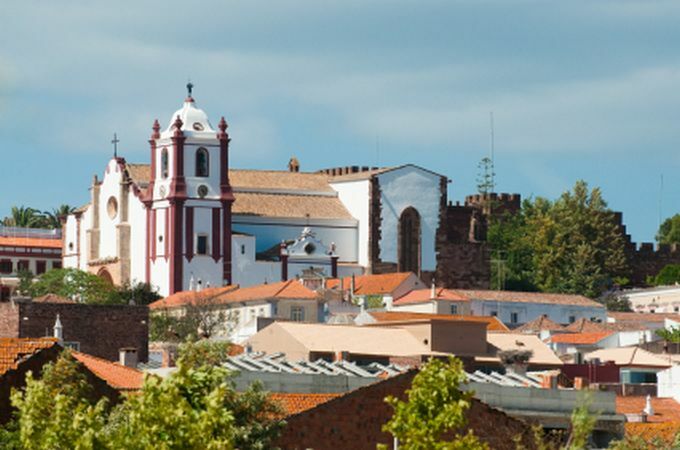 Things to do In Silves. CAFE INGLESThis Cafe Ingles is just one of those places to go if and when you find yourself in Silves Algarve Portugal. The cafe culture which southern European countries do so sublimely is found in the interior of elegance and on the lovely shaded terrace. The food is known to be excellent with the chocolate dish "St Emilion dessert" being their "piece de resistance". In summer time they may lay on Jazz concerts and occasionally African musical artists. Museu da Cortica.The Museu da Cortica is a cork factory.In many shops around the Algarve you will see wonderfull cork goods.These are made from the Amur oak or Cork Oak.The bags etc are quite exquisite but understandably fairly expensive.Many of these cork goods were manufactured here in the Fabrica do Ingles.Cork was a major industry in Silves untill 1995 when the factory was closed due to the river,Rio Arade silting up,making it very difficult,no impossible for, ships to reach the town. BARRAGEM DO FUNCHOVisit a dam on your holiday!Actually Funcho dam is more than worth a visit with a peaceful atmosphere and views to "die for".Obviously with the dam you also have a large resevoir.It is pretty easdy to find if you head east for Messines on the main N124 and then follow signs for Amorosa.You should then start picking up signs for the dam. Vineyards can make a great day out and those of Lagoa are as lovely as anywhere in the world.Visit the Adega Cooperativa in Lagoa,for delicious wine tasting trips and for a peaceful and relaxing day out day away from the beaches. Praca al Mr />ouhatamid Ibn Abbad ia actually a lovely large park,well worth visitingIt is supposed to be named after a famous Arab poet who I guess must have lived in Silves at some time.Or had some other important connection to the city. Because of its importance during the occupation by the Moors,much of the best and most important architecture in and around Silves is Moorish.